The Moto X Pure Edition is Motorola's third generation Moto X (aka Moto X 2015 or Moto X Style internationally). After two years of refinements, this most recent model got bigger and more powerful, but remained rather affordable compared to other companies' flagships. When Ryan reviewed it back in October, he said it was a joy to use and that the $400 you would put down on the 16GB version might be the best investment you could make on a smartphone. So how about $350 for the 32GB model? My math tells me that sounds even better. 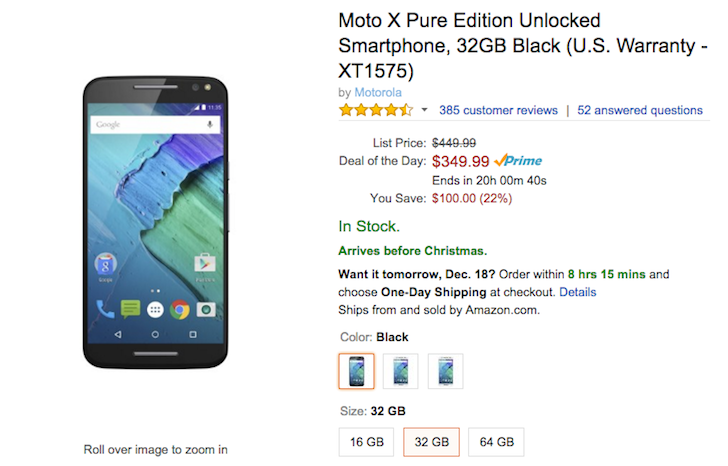 If you like the feel of $100 more dollars in your pocket when buying a new smartphone, you'll be happy to know that Amazon has a daily deal today on the unlocked Moto X Pure Edition. You can save $100 on the 32GB variant, which brings the price of the black and white models to $349.99 and that of the white bamboo option to $374.99. For that reduced price, you still get a 5.7" Quad HD LCD display, Snapdragon 808, 3GB of RAM, 21MP back camera and 5MP front camera, 3000mAh battery, and all the usual connectivity options with LTE cat. 6 and an imminent if not already available update to Android 6.0 Marshmallow. Shipping is free and there are less than 20 hours remaining to make up your mind.